Another used bookstore sci-fi stinker! This one had the bones of a good story, but did not live up to its potential. 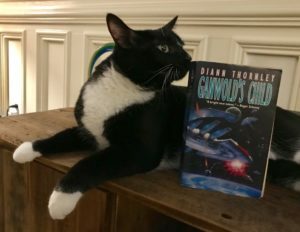 Two-year-old Tristan and his mother flee from some bad guys during an interstellar war, get menaced by some unfriendly aliens who are taking sides in the war, and then flee some more. The end up on Gan, taken in by the locals. Tristan is raised by the Gan, hunting and learning alongside his Gan brother Pulou. Gan are very hairy and have some kind of berserker mode where “someone always dies,” which you think would show up as important to the story later, since they talk about it all the time, but…it doesn’t. But that’s about all the description we get of the Gan. When Tristan’s mother becomes ill when he’s around 16, he and Pulou set off on a quest to find his father to ask for help. They make it to a human military settlement and promptly get their asses kicked and taken captive and sent into space. Tristan has his mother’s old e-gun and dog tags, so the bad guys from the earlier war know who he is. The rest of the book is an excruciating journey through Tristan’s captivity, where the evil General who hates his father forces Tristan to…go to school? To become a pilot. Even though he’s never been to any kind of school, and can barely read, and howls like a madman when they cut his hair and nails and try to make him wear boots. When Tristan remembers Pulou, who has now become more of a loyal dog than a brother (the hell? ), it’s mostly when they try to escape and get their asses kicked again. It’s all convoluted as hell. There are rebellions going on, and the evil general teaming up with the original unfriendly aliens from the beginning of the book, who are all bloodthirsty and awful (space Orcs!). There are stupid reasons Tristan’s dad can’t contact him, and the book spends an eternity on Tristan going to school! Why?!? How is it part of anybody’s master plan to make a kid who’s never driven a car (or used a phone, or a “bathing cubicle,” or seen an elevator, etc.) learn to fly a spacecraft? It could’ve been an interesting take on culture shock and nature vs. nurture and the importance of found family, but no. Yet another unnecessary tale of a whiny teenage boy. Lamps in the future are called illuminants. Names of aliens on the good guy council: CINC JONSPAFLT and CINC SPAFLT (all caps, each time). Why does this feel like Buckaroo Banzai all of a sudden? “He let his vision burn into the other man’s soul.” They do weird things with vision a lot. ‘He lifted his vision to the illuminant.’ You can’t just look at stuff in the future. Also, if you took a drink every time Tristan locked his teeth, you’d be dead by the halfway point. ‘He locked his teeth and set out.’ ‘He locked his teeth and picked up his pack.’ ‘Teeth locked, Tristan set his vision to the horizon.’ What does that even mean? ?